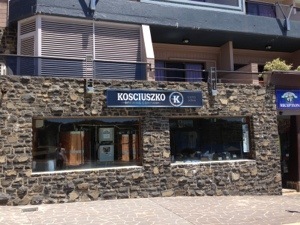 At most of the Thredbo bars I’ve visited in the last couple of days, Kosciuszko Pale Ale has been available either on tap or in the stubbie. We’ve already reviewed the Pale Ale on these pages when I saw it for the first time in Melbourne. I called it eminently repeatable then and that remains the case. It’s a cloudy, flavoursome pale that does the trick in these summer days. 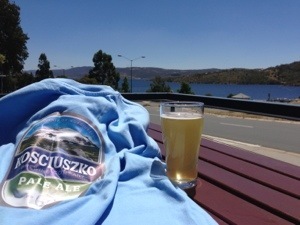 I had the opportunity to visit where it all began for Kosciuszko Brewing Co, the Banjo Paterson Inn. In April 2009, Chuck Hahn started up the “600 litre” microbrewery in a small room of the Banjo Paterson Inn. The Pale Ale is the flagship, but there are seasonals brewed from time to time. I was able to try the Mountain Wheat, which was a very pleasant wheat beer, if not a little innocuous. Still cloudy and very session able. The Banjo Paterson Inn is a pleasant place to drink. 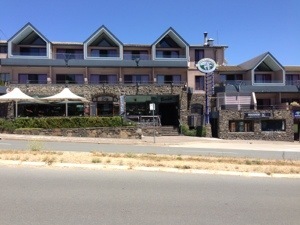 It overlooks Lake Jindabyne and has everything that opens and shut including a bistro, accommodation, a large TAB, as well as the microbrewery. There is a great outdoor area to drink whilst looking over the water. The brewery is tiny and it turns out that the Kosciuszko Pale I’ve been drinking was probably made at Camperdown aka the Malt Shovel Brewery. There’s no way the on-site brewery could supply Thredbo’s beer let alone the other outlets I’ve seen it at. Still, I ‘m sure this Kossie you drink at the Banjo is truly “from vat to tap”.